Monday, April 7, 2008 is a day for all guitar players to remember. The Echoplex inventor Mike Battle passed away at the age of 90. While you probably don't know who Mr. Battle was, you can be sure the music you listen to and want to learn how to play was influenced in part by his contribution to the music world. Who was Mike Battle? This gentleman was the Tubeplex and Echoplex inventor, creating these effects devices back in the 1960's. These "delay" effects units are the forerunners to every echo/delay effect used today. He originally invented the Echoplex for country western musicians. Chet Atkins was one of the first stars to use the device, followed by Les Paul (yea, the same Les Paul that came up with the design for the Gibson Les Paul guitar). It wasn't long until rock musicians saw the benefits of echo in their tunes. Both Jimmy Page of Led Zeppelin and Joe Walsh of James Gang/Eagles fame used Mr. Battle's Echoplex device in their music. If you're new to guitar, you might not realize what a significant contribution to rock music Mr. Battle gave us with his invention. 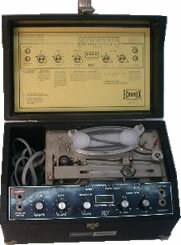 The Echoplex opened up many new sound effect possibilities that could be created utilizing echo and delay. There are so many effects pedals and amplification/recording devices modeled after the Echoplex it would be impossible to list them all here. before CDs and mp3s???) then loop the tape to create the echo (delay) effect. Nowadays, the effects are created digitally. Check out this wiki for more information about the echoplex effect. Here's a short history and very cool walk down memory lane by Mr. Battle himself, talking about the development of his Echoplex and some of the legends that he worked with - Mike Battle video. Scroll down the page to find his write-up. Also check out his Tubeplex homepage. A huge "hats off" and heartfelt "Thank You!" to Mr. Mike Battle, Echoplex inventor, for his invention and contribution to rock music! Rest in peace.